With the popular Nissan Rogue totally redesigned for 2014 with more features and amenities, Nissan is also offering a simplified lineup of the previous generation Rogue under the new "Rogue Select" nameplate. Designed to appeal to more price-sensitive buyers, Rogue Select is available at a starting Manufacturer&apos;s Suggested Retail Price* of under $20,000 USD. The 2014 Rogue Select is offered in just one trim level - Rogue Select S - in a choice of front-wheel drive or all-wheel drive. Just one equipment package is available, the S Convenience Package, with rear spoiler, roof rails, cruise control, RearView Monitor, 4.3-inch color audio display, SiriusXM Satellite Radio (SiriusXM subscription required, sold separately), Bluetooth Hands-free Phone System and more. The 2014 Rogue Select, like the all-new 2014 Rogue, is designed to satisfy both the functional needs of the buyers and their emotional needs - a combination that has made Rogue the second best-selling vehicles in the Nissan lineup. with chrome accent trim, rear liftgate with fixed glass and large front door openings for easy ingress and egress. A rear spoiler and roof rails are available with the Convenience Package. Every 2014 Rogue Select is built on Nissan&apos;s proven "C" platform, which provides high body stiffness with extensive use of high-strength steel. Rogue Select features a 105.9-inch wheelbase and 183.3-inch overall length, providing ample rear seat proportions. Rogue Select&apos;s interior includes the versatility provided by a large 57.9 cubic feet of cargo space (with 2nd row seat folded down). The interior includes a driver-oriented cockpit, 6-way adjustable driver&apos;s seat, 4-way adjustable front passenger&apos;s seat, seatback storage pockets, air conditioning with microfilter and versatile center console with a lid, coin and cell phone holders. A rear 60/40 split-fold bench seat and oversize glove compartment are also standard. Available features include the RearView Monitor, a 4.3-inch color display audio system with USB interface, Bluetooth Hands-free Phone System, SiriusXM Satellite Radio (SiriusXM subscription required, sold separately), cruise control and steering wheel-mounted audio controls. Engaging performance is provided by Rogue Select&apos;s standard QR25DE 2.5-liter DOHC 16-valve inline 4-cylinder, which is rated at 170 horsepower and 175 lb-ft torque. The engine is tuned to provide ample torque in the low-to-mid rpm range for smooth, powerful acceleration and quick initial response from a standing start. The engine features an aluminum block, 9.6:1 compression ratio and large diameter intake port and exhaust manifold. Every 2014 Rogue Select comes with a standard Nissan Xtronic CVT, combining smooth, linear and responsive acceleration feel with high-efficiency operation. Rogue Select&apos;s CVT utilizes Adaptive Shift Control and a high-speed central processing unit. Its advanced shift control offers the optimal shift pattern according to the driving situation and driver&apos;s demands, using input from driver operation, vehicle speed, road gradient, turning condition and acceleration to adjust shifting patterns accordingly. A "Sport Mode" switch is standard. Rogue Select fuel economy is rated at 23 mpg City/28 mpg Highway for front-wheel drive models and 22 mpg City/27mpg mpg Highway for all-wheel drive models. Rogue Select AWD models feature an intuitive All-Wheel Drive system. The system helps provides excellent all-weather performance and traction. Every Rogue Select also features standard Vehicle Dynamic Control (VDC) with Traction Control System (TCS) and 2-wheel or 4-wheel limited slip (ABLS). Also standard is a 4-wheel independent suspension. The front suspension includes subframe-mounted independent struts with coil springs, high-performance shock absorbers with rebound springs, and a stabilizer bar. The rear independent multi-link suspension includes aluminum-alloy upper links, high-performance shock absorbers with rebound springs and stabilizer bar. The rear suspension design allows maximum luggage space (versus a rear strut design). Responsive steering is provided by an Electric Power-assisted Steering (EPS) system. Every Rogue Select also comes equipped with standard power-assisted front and rear vented disc brakes with standard Anti-lock Braking System (ABS) with Electronic Brake force Distribution (EBD) and Brake Assist. Rogue Select comes with 16-inch steel wheels and 215/70R16 tires. Standard safety features include the Nissan Advanced Air Bag System (AABS) with dual-stage supplemental front air bags with seat belt and occupant classification sensors; front seat-mounted side impact supplemental air bags; roof-mounted curtain side impact supplemental air bags with rollover sensor for front and rear-seat outboard occupant head protection; front seat Active Head Restraints; 3-point front and rear seatbelts, front seat belts with pre-tensioners, load limiters and adjustable upper anchors and LATCH System (Lower Anchors and Tethers for CHildren). 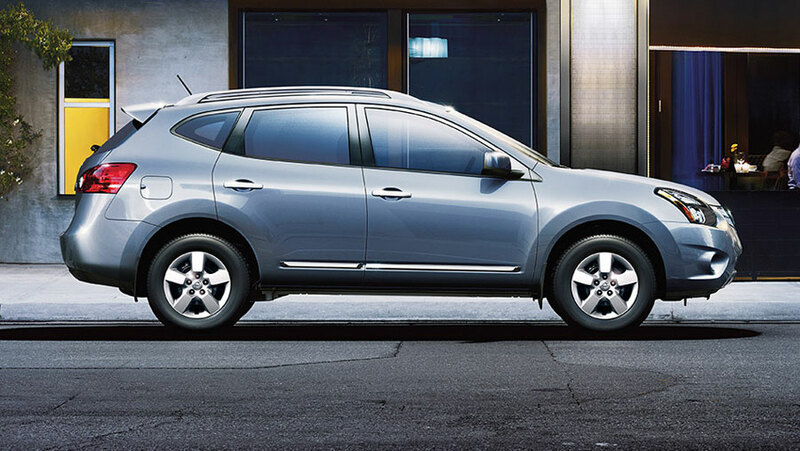 Every Rogue Select also offers child safety rear door locks; Zone Body construction featuring front and rear crumple zones and occupant zone; Nissan Immobilizer system and anti-theft alarm system; and Tire Pressure Monitoring System (TPMS). The 2014 Rogue Select is available in one well-equipped model: Rogue Select S, in all-wheel drive and front-wheel drive configurations, with one available package: S Convenience Package. It is assembled by Nissan Motor Co., Ltd. in Kyushu, Japan. For full information on the all-new 2014 Nissan Rogue, please go to NissanNews.com.